Wader Quest: Wader Conservation November round up. Wader Conservation November round up. Our events for Wader Conservation November came to an end yesterday with the final day of Waderfest held at RSPB Titchwell Marsh. Short video clip of summary of Wader Conservation November. We would like to thank the RSPB for partnering this event and for hosting it at the fabulous Titchwell Marsh reserve. 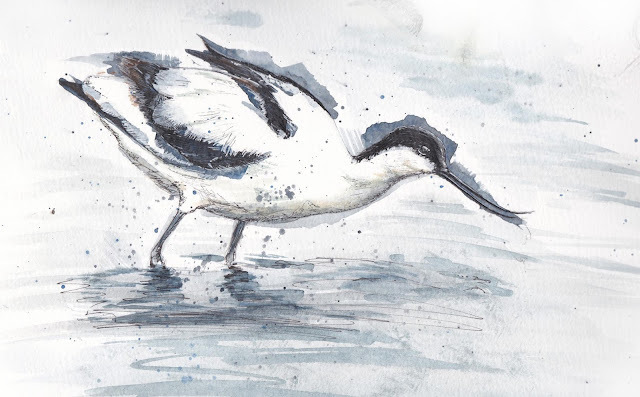 We also want to thank the Wash Wader Ringing Group for their involvement and also Dan Bradbury who stepped into the breach on Saturday to talk to people about his art and to produce an artwork for Wader Quest. Pied Avocet by Dan Bradbury painted in the Parrinder hide during 'Waderfest' the Wash Wader Festival. We are also grateful to stalwart Wader Quest volunteers Andrew Whitelee and Penny Insole for their help with meeting and greeting people at the reserve centre and for their kindness in bringing us a reviving cup of tea later in the day. Andrew is also organising the Norfolk Bird Race on 30th April 2016, the proceeds from which will be going to Wader Quest. So if you fancy a bit of fun that will help us at the same time, make a note in your diary and get in touch with either Andrew through the twitter site @NorfolkBirdRace or ourselves for further details. Rick Simpson taking delivery f the life giving brew from Andrew Whitelee and Penny Insole. We also owe a big vote of thanks to Matt Merritt and Birdwatching Magazine who have supported the Wader Conservation November initiative from the outset even having a wader special edition in November to coincide with the events and the board of Trustees for supporting the events especially Sue Healey who helped to mould them. Helping people to find and identify waders in the Parrinder Hide at RSPB Titchwell Marsh. Throughout the month the weather has been a big factor, even in the Wader Conservation World Watch weekend some people were thwarted in countries around the world by bad weather preventing them from seeing many species or indeed getting out at all. So that's why they are called Golden Plovers! Single bird hunkering down to avoid the blustery wind. The Wirral Wader Festival coincided with the worst storm of the year which seemed to have its epicentre right over the Wirral but thanks to the excellent organisation of the event by Karen Leeming and Sheila Ryde of the Dee Estuary Voluntary Wardens, Lynne Greenstreet and Matt Thomas of the Wirral Country Park Rangers at Thurstaston, Sarah Bennett of the Cheshire Wildlife Trust and Dan Trotman of RSPB Burton Mere Wetlands it failed to dampen our spirits and we enjoyed a highly successful event. We also enjoyed great support from Robert Parkin artist and conservationist, Ruth Miller and Alan Davies of Birdwatching Trips with the Biggest Twitch, Shore Cottage Studios and Liverpool Museum, British Natural History Museum, Opticron for the painting competition prizes and volunteer John Davies with his friend Sue. The weather was kinder at Martin Mere, but, as we weren't doing anything outside, this benevolence was not fully appreciated by the team the main thrust being our stand and the display of the children's painting competition winners. Martin Mere stand and children's painting display. A rare break in the dull skies over the fresh marsh you can see how the wind is whipping up the water surface. In terms of attendance obviously this weather situation did make a difference, but the fact that things went as well as they did shows that, should we decide to do the whole thing or something similar again next year, then the potential for the events to develop is enormous. All concerned expressed an interest in doing the same again with some minor adjustments maybe so here's looking forward to Wader Conservation November 2016. 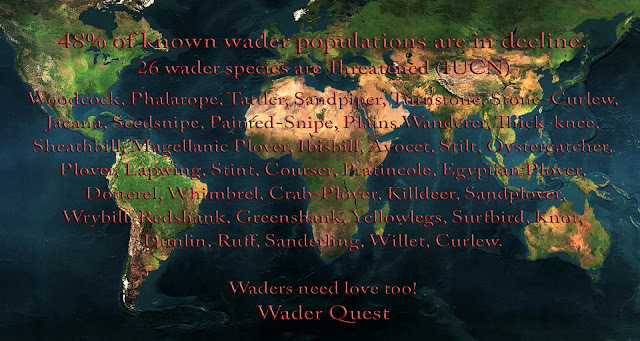 One thing is for sure Wader Conservation World Watch will definitely take place on 5th and 6th of November 2016; for other events, watch this space.